Washington — What does it take to go from practicing dentistry to practicing politics? 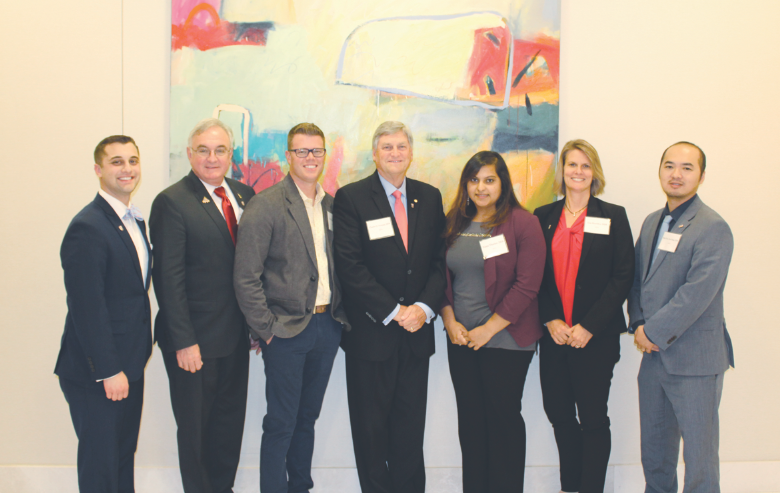 That was the focus of the 7th Annual Specialty Physician and Dentist Candidate Workshop supported by the American Dental Political Action Committee, according to ADA News. Ready to run: ADA members learn the ins and outs of running for office. From left are Drs. James Wanamaker, Richard Andolina, Tom Blaisdell, Charles Norman, Nipa Thakkar, Lisa Knowles and Paul Hsiao. Seven ADA member dentists attended the Sept. 29-Oct. 1 workshop to learn what it takes to run for local, state or federal office. They are Drs. Richard Andolina, Tom Blaisdell, Paul Hsiao, Lisa Knowles, Charles Norman (a past ADA president), Nipa Thakkar and James Wanamaker. The sessions focused on the ins and outs of constructing a successful campaign, including how to build a campaign organization and grassroots campaign. The workshops also explained how to understand political polls and use them to a campaign’s advantage. Other sessions explained messaging and why keeping a campaign’s message simple, direct and easy to understand is paramount. Social media, fundraising and marketing and advertising tactics were also covered. In addition to ADPAC, other hosts of the event included the American College of Radiology RADPAC, American Association of Orthopaedic Surgeons, American Society of Anesthesiologists, National Emergency Medicine PAC, American Congress of Obstetricians and Gynecologists OB-GYN PAC and American Osteopathic Information Association PAC.